The installation of solar panels at RPT’s Grand Junction, Colorado facility expects to reduce traditional energy consumption by 10 percent. 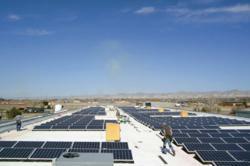 The panels are part of an ongoing effort to improve sustainability at the high desert acrylic manufacturing facility. Workers finish installing the 404 panel 100 kilowatt solar panel system on RPT's roof. The system is part of an ongoing effort to improve the facility's carbon footprint. Installing this solar panel system offered a good way to [reduce our carbon footprint]. It reduces our traditional energy consumption by 10 percent and was the right time for us to move forward with this project. A few months ago, all the power Reynolds Polymer Technology, Inc.(RPT) needed to run the ovens that form the acrylic for commercial aquariums, power the computers in use throughout the building, or simply turn on the lights all came from one place – the power company. That’s all changing now, thanks to a new solar panel array installed on RPT’s roof. The 404 panel solar system with nine inverters will save RPT about $1,000 each month in electric costs. With electricity rates increasing each year, those savings will increase, too. Calculations predict that those savings will add up and the array of panels will pay for itself in less than 5 years. The 100 kilowatt photovoltaic system ties into the traditional power grid. All solar power generated gets distributed throughout the building with any surplus solar polar sold back to the power company. All the panels and power inverters are US-made and installed using a ballasted roof installation to prevent any penetration through the roof structure or roof materials. The addition of solar power complements the existing efforts in place to improve RPT’s sustainability. A water reclamation system started in 2009 currently reduces water consumption by 41.3 percent, changing to high efficiency lighting saved 50 percent on the lighting bill, the painting of the roof white reduced energy consumption as it keeps the shop floor cooler in the summer, and various recycling programs in place ensure as much waste as possible is kept out of the landfill. About Reynolds Polymer Technology, Inc.
Reynolds Polymer Technology, Inc. has completed more than 1,600 projects in 53 countries in their nearly 30 years in business. RPT is known as the leading manufacturer, fabricator, designer, and installer of R-Cast® acrylic and resin sheets. In fact, RPT is the only acrylic aquarium panel manufacturer in the U.S. Their products have been used extensively in the architectural, signage, aquarium, water-retaining, and scientific industries worldwide, including major projects in Asia, Europe, the Middle East, and South America. RPT is constantly raising the standard for what can be done with acrylic and resins. Headquartered in Grand Junction, Colorado, RPT also has operations in Rayong, Thailand. Visit http://www.reynoldspolymer.com for more information. Proud member of the U.S. Green Building Council. 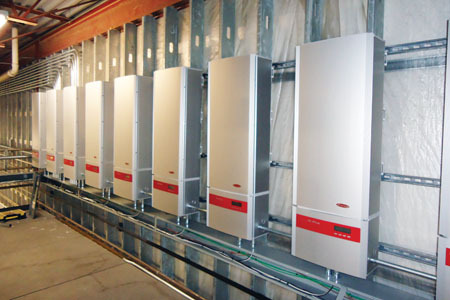 Nine inverters gather the solar energy and distribute throughout RPT's facility. Changing to solar power expects to save RPT $1,000 per month in utilities and is expected to pay for itself in less thaNine inverters at RPT distribute the solar energy throughout the facility.